Also the last day to purchase raffle tickets, we will draw the winners at the end of the Cookie Walk. Prizes are: Handmade Quilt, Hand Knit Sweater and a painting. Come meet Mr. and Mrs. Santa in Scrummy Hall – Scrummy Afters new event room. Or stop by anytime on Saturday from 9 am – 6 pm. 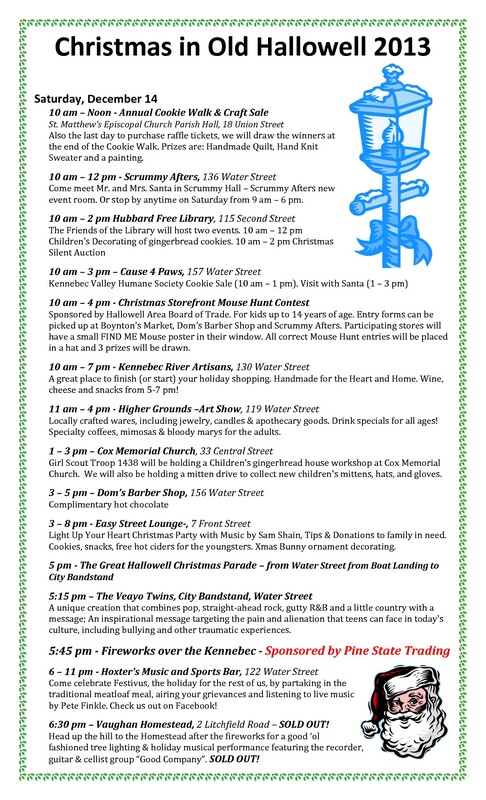 Sponsored by Hallowell Area Board of Trade. For kids up to 14 years of age. Entry forms can be picked up at Boynton’s Market, Dom’s Barber Shop and Scrummy Afters. Participating stores will have a small FIND ME Mouse poster in their window. All correct Mouse Hunt entries will be placed in a hat and 3 prizes will be drawn. A great place to finish (or start) your holiday shopping. Handmade for the Heart and Home. Wine, cheese and snacks from 5-7 pm! Locally crafted wares, including jewelry, candles & apothecary goods. Drink specials for all ages! Specialty coffees, mimosas & bloody marys for the adults. Girl Scout Troop 1438 will be holding a Children’s gingerbread house workshop at Cox Memorial Church. We will also be holding a mitten drive to collect new children’s mittens, hats, and gloves. Light Up Your Heart Christmas Party with Music by Sam Shain, Tips & Donations to family in need. Cookies, snacks, free hot ciders for the youngsters. Xmas Bunny ornament decorating. A unique creation that combines pop, straight-ahead rock, gutty R&B and a little country with a message; An inspirational message targeting the pain and alienation that teens can face in today’s culture, including bullying and other traumatic experiences. Come celebrate Festivus, the holiday for the rest of us, by partaking in the traditional meatloaf meal, airing your grievances and listening to live music by Pete Finkle. Check us out on Facebook! 6:30 pm – Vaughan Homestead, 2 Litchfield Road – SOLD OUT! Head up the hill to the Homestead after the fireworks for a good ‘ol fashioned tree lighting & holiday musical performance featuring the recorder, guitar & cellist group “Good Company”. SOLD OUT! 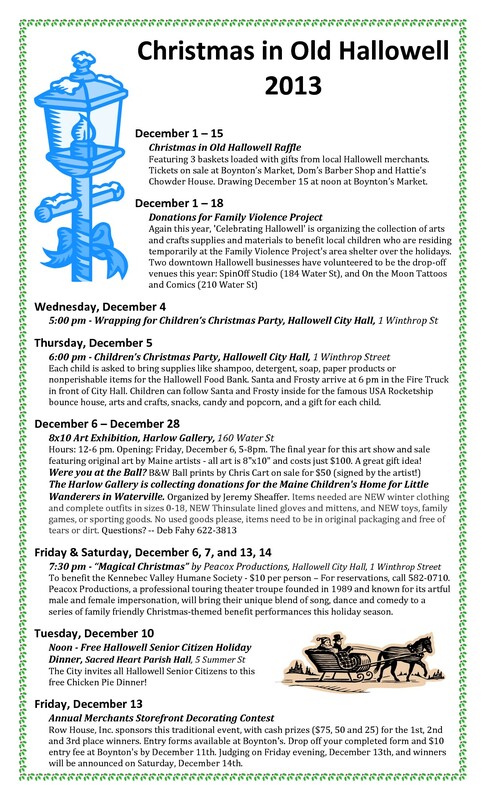 Christmas in Old Hallowell Raffle!